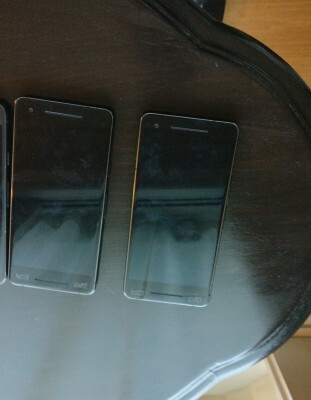 A tipster sent us a photo of what's allegedly the Google Pixel 2. It’s clearly an early dev unit with all those stickers on the back. But that’s not the interesting part – our eyes are drawn to the glass panel on the back, which is now smaller. You can see just how curved the glass is in this image. And if you look closely, you’ll spot two LEDs in the flash next to the single camera. Several previous leaks have shown a Laser autofocus assembly below the flash, but it’s hard to spot on this image. Our tipster reports that there's no 3.5mm headphone jack (sigh! ), but the phone definitely looks like it has stereo speakers on the front. The in-hand feel was reportedly better than the original Pixel, sleek and elegant. A big thanks to our anonymous tipster! 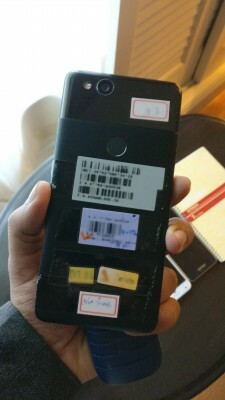 looks like a good phone for 2012 This design in 2017 looks like cheap chinese toy. huge besels are obsolete.